I have heard great things about Seventh Generation products but, had never purchased them or used them myself. I have a toddler with sensitive skin so I was really wanting to try out their baby and toddler products. I asked for the Natural Baby starter kit and was sent baby wipes, diapers, laundry detergent and a reusable tote. The chlorine free diapers are soft, fluffy where they need to be and fit my daughter well. I love that they are unbleached, latex and fragrance free. My daughter is potty trained but uses them still for nap and bedtimes. My daughter's night time diapers have never leaked, so that is a major plus! The tub of wipes and refill contained wipes that are whitened by natural means, chlorine free and chemical free. They are made with natural cloth that has not been processed chemically. They are also non irritating and alcohol free. These are things that most moms are starting to think about now after years of not questioning what was going into our children's products. The Natural baby laundry detergent contains no phosphates, dyes, or fragrances. It is septic safe, biodegradable, non-toxic, hypoallergenic, free of optic brighteners, and kosher certified. I've used it for a few loads now and my laundry comes out very clean. I have had no problems with it not cleaning her clothes and making them bright. It makes me feel good that it isn't bad for the water and is great for my daughters skin. I live in Phoenix metro area so it's already been full blown Summer out here. I've been using the tote for swimming gear and towels for awhile now and I love it. The tote is thin and dries very quickly. It's a great multi purpose tote that you can use while your shopping for groceries or for everyday use. I also wanted to talk about their multi purpose cleaner. They sell naturally scented cleaners but, the one I used was fragrance free and dye free. I live in an apartment and my counters are white. Not a blend of any color, but white! The multi purpose cleaner wasn't harsh when I sprayed it, cleaned all the food up off the counters and the stove without leaving a residue and of course is non-toxic. For the amount I will be using this cleaner, it's definitely on my list to buy more. I love how well it cleans and how safe it is. I have slowly been adding things that are natural into our lives. Sometimes yes, it can be difficult with a small budget. Seventh Generation products are affordable, and safe to use in your home. They are safe around children and pets. They leave your house clean without artificial fragrances and dyes. I would recommend their baby and toddler products after using them to anyone. You can purchase items at seventhgeneration.com or in any local participating stores that sell their brand. 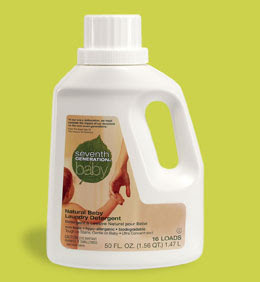 Seventh Generation has been extremely generous and is giving away a natural baby starter kit! The kit includes one package of diapers or training pants(designate size), 1 tub of chlorine free baby wipes, 1 baby wipe refill, Natural baby laundry detergent, and a reusable tote. Please go to seventhgeneration.com and tell me a product that you would love to try out. You must follow this or you will be disqualified. This contest is open to everyone. Please leave an email address so that I can contact you for your win. You can earn extra entries by following me on twitter @kaiasmommy, following me here on blogger, and/or tweeting about this contest. Please leave a separate entry for each. Contest ends June 23, 2009 at 11:59 pm Arizona time. I would love to try the Chlorine Free Menstrual pads. Besides the items in this giveaway, I'd also love to try the automatic dishwashing packs. I've actually been wanting to try their pads and tampons for quite a while, but no store around me carries them. I'm entering this for a friend who just had a baby! I'd like to try the Natural Dish Liquid. I would love to try their natural dish liquid. I find it hard to find a natural dish soap that works well on grease. Thank you for the giveaway. I'd love to try the cleaners or menstrual pads. I would love to try the natural fabric softener. I'd like to try all of their 100% recycled paper products. Thanks! I'm interested in trying the dishwasher packs. i would like the Free & Clear Automatic Dishwasher Powder. I'd love to win Natural Dish Liquid. I love their dish soap so I would love to try their dishwasher soap! I would like to try out the automatic dishwashing packs. I would like to try the diapers! well, my son would...not me of course! I'd love to try the baby laundry liquid detergent! I like to try the free & clear natural fabric softener sheets. I'd like to try the free and clear all purpose natural cleanser. I would love to try the Natural Powdered Laundry soap. I would love to try the Natural 2X Concentrated Laundry Liquid. I'd like to try the "Wild Orange & Cedar Spice" kitchen cleaner. I'm following you on Google Friends. I haven't yet, but I've always wanted to try their disposable diapers for travel use. I didn't know they had other things in their store! The dishwasher detergent is also something I think I'll try. I want to try the Recycled Trash Bags! I would love to try the trash bags. I think that it is cool that they have been recycled. I would love to try out the tissues and paper towels. :) I think they would take some of the guilt out of the necessity of using them! like to try delicate care laundry detergent ty. Free & Clear Automatic Dishwasher Powder I would love to try, seems Cascade has bid its' time. I would love to try the automatic dishwashing packs. The natural dish liquid sounds like a winner to me. Thanks! I'd like to try their ultra thin pads (chlorine free). I would love to try their Free & Clear Natural Fabric Softener. I love fabric softener but will NOT use the leading brands as I know they are full of chemicals, so this would be fun to try! So many of the Seventh Generation products sound appealing because they are safe and healthy for my family! I'd love to try the Natural 2X Concentrated Laundry Liquid, it sounds not only safe and healthy for my family but also for the environment, its a win, win product for sure. Thanks so much for the chance to enter. I would love to try the automatic dishwasher pacs. I'd like to try the chlorine free diapers. I would love to try the Tub & Tile Cleaner — Emerald Cypress & Fir. I would love to try the Chlorine Free Training Pants for my daughter. The Chlorine Free Menstrual pads sound like a natural alternative to that time of the month. I would love to try the Automatic Dishwasher Detergent Pacs. I would like to try their paper towels. I'd like to try Chlorine-Free Pantiliners. I would love to try the Natural 2X Concentrated Laundry Liquid! I would like the Natural 2X Concentrated Laundry Liquid. The Natural Dish Liquid looks very nice!